6mm-Minis is Maksim-Smelchak's blog to discuss gaming, miniatures, books, movies, food, Israel, Judaism, life in general and other funny crud. My favorite scale of miniatures is 6mm, which is also called 1/285 or 1/300 scale. I enjoy many different kinds of games including ancients, Napoleonics, WWI, WWII, the Arab-Israeli conflict, Car Wars AKA Autoduel (a sort of crash'n'derby automobile combat game), 6mm Godzilla AKA Kaiju games, and science fiction games. I'm open to everything though! 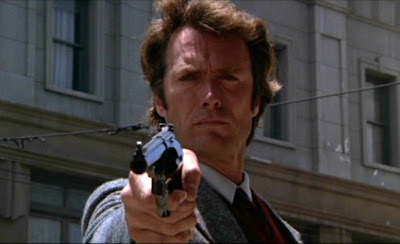 WEIRD NEWS: Do You Feel Lucky, Punk? Happy 77th birthday, Clint Eastwood! May all the punks have unlucky days! Notes regarding photos / pictures: These are not all my images. 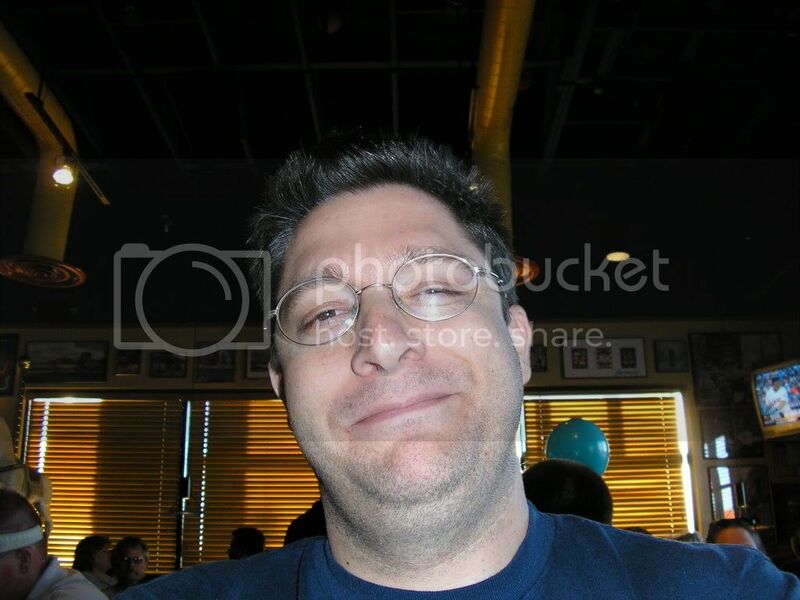 I am using various images from around the web, mostly from public sources and/or private sources used with permission. 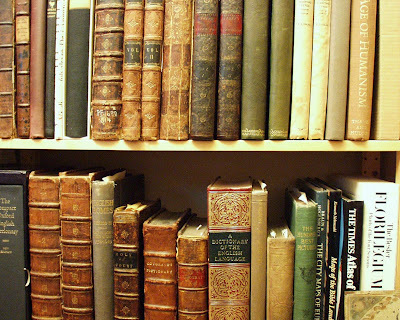 I have tried to include only images under public domain, creative commons, or fair use. If I have inadvertently violated any copyrights, please inform me and I will remove your image/s (if it is indeed an infringement). GAMING NEWS: DRM Releases Preview Ruleset! Happy Memorial Day to those in the USA! And Doug and the Team over at DRM (Dark Realm Miniatures) have released their new ruleset for their fine line of miniatures. The first public version of our new rules is available to download now! 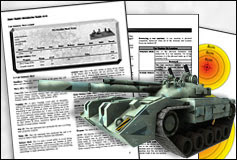 The 22 page pdf file includes everything you'll need to get your armies into action. As well as the core rules and mechanics the file also includes counters and area of effect blast templates. Remember, these rules are currently at the testing stage. We still need your feedback to help iron-out the bugs and improve them. Make sure you post all your thoughts and comments in the DRM Forums. FUN VIDEOS: Orky Peace Protest! This is what happens when Orkz and Goblinz protest violence very pinkishly to a Shania Twayne beat... very progressive of them! ORKZ: The large green-skinned ones without pointy hats in the video. GOBLINZ: The small green-skinned ones with pointy hoods in the video. SQUIGZ: The pink critters in the video. They're all characters in the fantasy universe created by "The Evil Empire" or GW... and, in turn, based upon the fantasy archtypes created by the magnificent J.R.R. Tolkien, who most certainly never imagined pacifist Orkz (...who speak with really bad Cockney accents and can't spell). See? GW really has brought something to the fantasy genre! Oh, and by the way, many compliments to Thoumas in Austria who created the video and... I'm guessing the lovely pacifist Orkz as well! Hat tip to Nils... again. Notes regarding photos / pictures / videos: These are not all my images and videos. I am using various images and videos from around the web, mostly from public sources and/or private sources used with permission. I have tried to include only images and videos under public domain, creative commons, or fair use. If I have inadvertently violated any copyrights, please inform me and I will remove your image/s (if it is indeed an infringement). Big weekend planned with the Kublacon gaming convention (link on the right sidebar), three days of time off and all that good stuff! Additionally, I will hopefully have some juicy aviation and gaming photos up soon from the last MWSS gaming club meeting and my trip to The National Air & Space Museum in Washington DC. I downloaded them to my home PC and now only need to transfer them into my Photobucket. 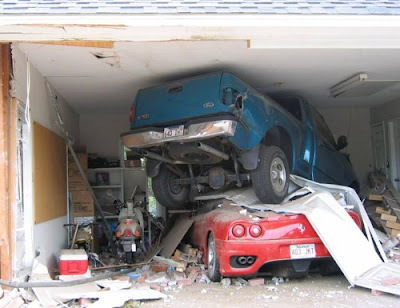 Before you return from your trip I just want to let you know about the small accident I had with the pickup truck when I turned into the driveway. Fortunately it's not too bad and I really didn't get hurt, so please don't worry too much about me. I was coming home from Wal-Mart, and when I turned into the driveway I accidentally pushed down on the accelerator instead of the brake. The garage door is slightly bent but the pick up fortunately came to a halt when it bumped into your car. I am really sorry, but I know with your kind-hearted personality you will forgive me. You know how much I love you and care for you my sweetheart. I am enclosing a picture for you. I cannot wait to hold you in my arms again. A hat tip to a blog called "Grouchy Old Cripple In Atlanta." "Hell hath no fury like a scorned..."
The other day ago I spent some time looking for a used book and came up with bopkes (nothing). So, I made an inquiry on one of my favorite on-line forums, The Miniatures Page (TMP, link on right sidebar). - Links to various commercial sellers of the book including Amazon, B&N, etc. Unfortunately, I've been too blasted busy at work to evaluate all of these sellers, but I will as time permits. Thanks again to all those who helped! 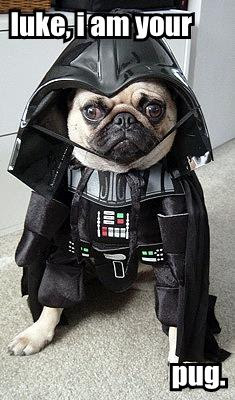 WEIRD NEWS: The Revenge of Darth Pug!
. 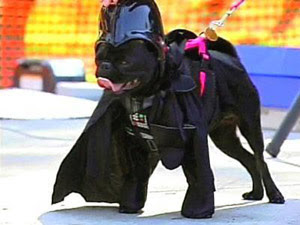 Some sick fiend appears to have recast Star Wars... with pugs! What a great weekend I had! Gaming out the wazoo! 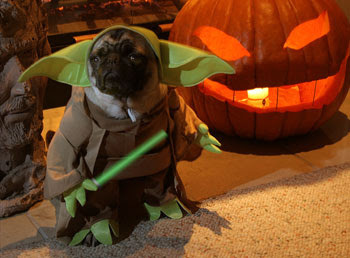 "You can't go wrong with Star Wars, Halloween, and pugs... can you?" Saturday was the MWSS (Miniatures Wargaming Society of Sacramento) meeting during which we had plenty of great games! If you're interested in playing some miniatures games or boardgames with a bunch of nice folks, please check out the link I have for the MWS AKA MWSS groups on my right sidebar. I took lots of photos, which I hope to share soon along with a better write-up of the games played. "Uh Bill, please cue the Imperial March..."
And Sunday was Kevin E.'s birthday, a local gaming nut! We work at a number of local gaming conventions together and he's well known for being a strong supporter of the Boardgame Meet-up Group. If you're interested in playing some boardgames with a bunch of nice folks, please check out the link I have for Boardgame Meet-up Group on my right sidebar. The birthday party was fun! We played tons of game and socialized to our heart's galore. One of the guests brought a huge "chocolate fountain," something I'd never seen before. 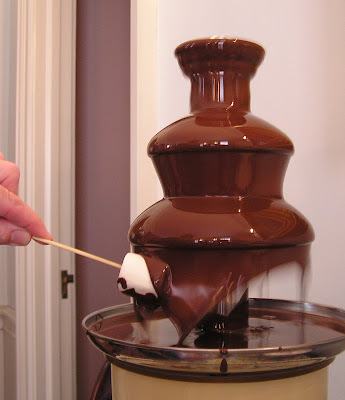 It was basically a chocolate fondue pot that allowed melted chocolate to flow through a water fountain device in which you could dip fruit pieces, cookies, or other goodies. Pretty cool. The BBQ was nice as well! The Chocolate Fountain - watch out! And I also got to pass on a monkey figure I found for my friend Mike's son. We both think that he'll like it. 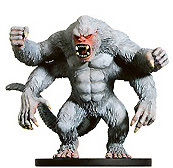 Conor has been working on a Godzilla collection like me and needed a good Kong. The Fiendish Giralon, a D&D Miniatures collectible figure. 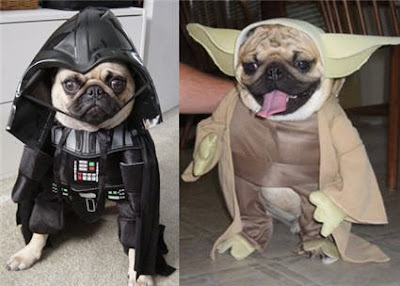 And, of course, the theme of this post is "Dogs & Star Wars." "Luke, I am your father..."
I simply had NO idea! "Uh, Captain, there's been a horrible accident with the transporters..."
"Scotty may never be the same..."
HASBARA: Six Day War Redux!
. 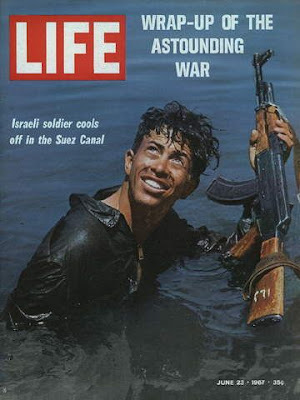 Yossi Ben Hanan, later tank commander, refreshing in the Suez Canal. - With the fortieth anniversary of the liberation of Jerusalem from Jordan, I'm seeing a plethora of articles about The 1967 Six Day War that may be of interest to AIW (Arab-Israeli Wars) miniatures gamers. 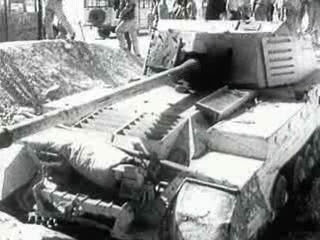 "A Prelude to the Six Days"
"Power, Faith, and Fantasy: The United States in the Middle East, 1776 to 2006"
Egyptian Archer tank captured in the Sinai. 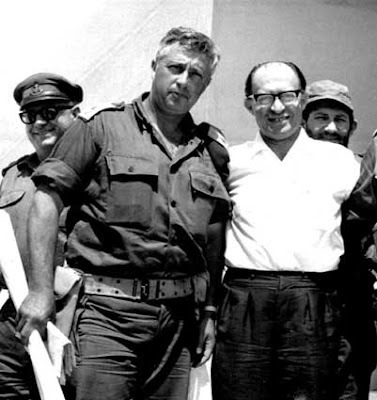 "Did Israel Want The Six Day War?" 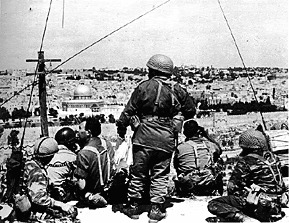 Israeli paratroopers after they liberated Jerusalem. "The Battle For Jerusalem, June 5-7, 1967"
"The Yom Kippur War: The Epic Encounter That Transformed the Middle East"
- Rabinovich has a very different writing style than Oren and his research is less authoritative, but his books have a less academic and thus more entertaining feel to them. Read Oren for academic history backed by solid fact and relentless research; read Rabinovich to be entertained and to get an "in a nut shell" history of the war. 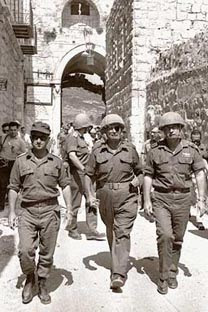 The "Big Three," Narkis, Dayan, & Rabin, entering Bethlehem triumphant. - They can be found cheaply as used paperbacks and employ charismatic characters set against the backdrop of Israel's many wars for survival. Sharon and Begin in 1967, the beginning of a long and successful relationship. "Foxbats over Dimona: The Soviets' Nuclear Gamble in the Six-Day War"
- The new book tells the history of the Soviet involvement in The Six Day War, with the premise that the Soviets engineered the war in hopes of overthrowing the government of Israel and installing a puppet state in its stead. Very interesting. 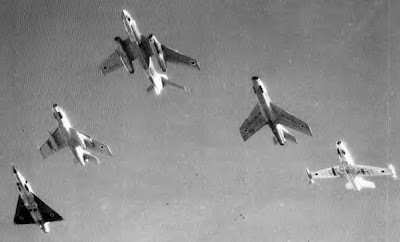 Israeli jets in a flyby after the war: Mirage, Mystere, Vautor & Magister. "Soviets engineered Six Day War"
- So, for folks interested in AIW history, now is a particularly rich time to study with Soviet archives opening up, US historical documents being shared, and a great need to look back on history with critical regard and analysis. Comments are down on this post due to an internal Blogger glitch. Blogger is working on fixing it. HUMOUR: Kirk, Nils & WHAT!@$%&*!?
. Kirk must love "improvised weaponry." 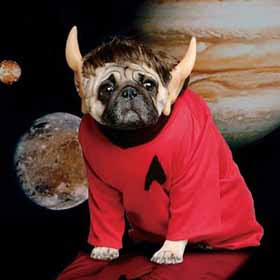 For The Sci fi Geeks Among Us! 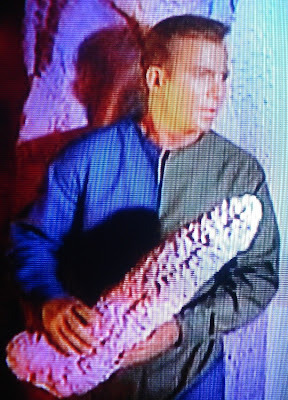 Kirk is holding a “stalactite” that he ripped off the ceiling of the cave. I wonder how many times they had to shoot this one to keep everybody from cracking up??? By the way, stalactites are the ones that grow from the ceiling down and stalagmites the ones that grow from the floor up. And that is definitely the weapon he should have used to take on the Gorn, not that silly homemade blackpowder contraption... could have really given the Gorn a piece of his mind with that "object." I can't help but enjoy some of these sorts of gags... hope you do too! 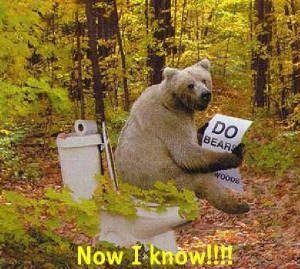 "Do bears wipe in the woods?" Have a great Hump Day AKA Wednesday! 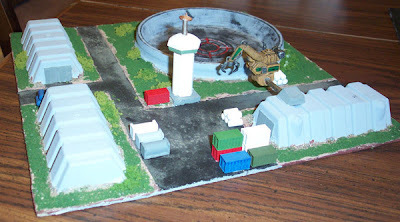 MINI WARGAMING: Jav-98's 6mm Sci-fi Startown!
. 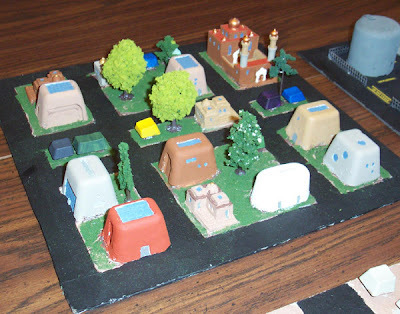 Javelin-98's awesome 6mm city terrain tiles. Hope you're all keeping busy like me... in a good way. Life as usual has been pressing... my workplace lost a body so I'm pulling double duty until a new employee gets hired. And on that observation, I always seem to have FAR MORE ideas for blogging material than I have time! 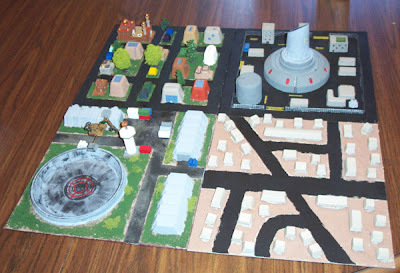 OVERVIEW of the four 6mm sci-fi city modules. Jav: I've been working on something like this for some time, only using 12" square tiles. So far I have four tiles in various stages of completion -- a low-income residential area, an upscale residential area, a powerplant block, and a spaceport. My idea was to put the roadway around the edges in the single-lane square configuration with smaller roads criss-crossing the interior. While the tiles are all still in a state of infancy, I can post pics of what I have so far. Okay, bear in mind that these are a work in progress of the utmost sort. The spaceport and powerplant are nearly done; the two residential blocks are still far from finished. The one covered with keyboard buttons was inspired by the Tau University entry by Vanvlak from a past EpiComp (I think '05). After starting the first two tiles, I realized that aligning the streets would be a problem. That's why the powerplant and the more finished of the two residential tiles have streets along the margins. The cargo bunkers at the spaceport are made from electrical tape blister packaging. The landing pad is made from the bottom of a USB joystick package. The tower is a section of old Crayola marker topped with two bases (a flight base on top of an upside down hex-shaped slotta base). The only purchased content are the cargo containers from Old Crow and the gantry crane arm made from a Mechwarrior clickie tech TM mech. Javelin-98's spaceport landing pad reminds me of the blast pits from the Traveller science fiction setting. 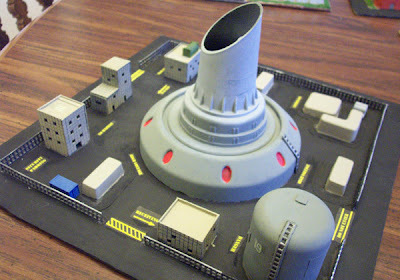 Jav: The power plant was made from two "reclaimed" items: the bottom is made from the top lid of the same USB joystick package that I used for the spaceport and the steam stack is made from a pour spout for paint cans which I found at Home Despot for $1.50 USD. The buildings with windows were made from plasticard (the type with 1/8" squares on it) while the other buildings are made from various blister packs. The fence is cross-stitch fabric. The big oil tank thingie (technical term, of course) is the lid from my wife's last can of styling mousse. My next step with this block is to add some rust streaks and dirty up the asphalt with some playground sand. Jav: This upscale residential block is made using two types of purchased items: the mosque and four JR Miniatures Middle Eastern houses. OK, maybe three if you include the trees. Everything else is either keyboard keys or blockhouses made using plaster poured into ice-cube trays. I decorated the inside the of the ice-cube tray with bits of plasticard and sprue, which left some nice impressions (...like the skylights-slash-rooftop pools). I'm still in the process of painting this one; after it gets a clearcoat, I'll hit the houses with a wash.
Jav: The fourth tile is still very much in progress, needing more paint, flocking, trees, and street markings. It was the first tile I started on, but the others were more interesting, so they got more love. 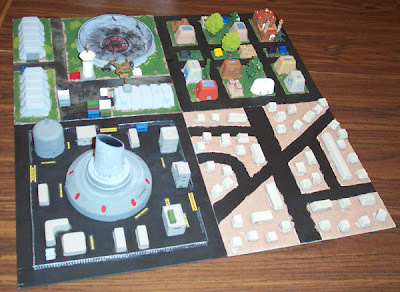 I have this plan in the back of my mind to create 12" square vacuformed terrain tiles. I think that something like that would work well and give people instant cities for a very low price. Sadly, I know nothing about vacuforming, so that project is quite a ways off. Moscovian: With that level of ingenuity, I am shocked you bought your trees! I can gve you a very cheap alternative that IMHO looks better than the the ones they sell online. I used to make miniature trees for a landscaping company. The only drawback is you have to be careful how you store them or they won't last long. Still, I love all the goofy bits of stuff being turned into a work of art. I have collected a trash bag full of plastic containers and things for this very purpose. Every time we get something sealed in a plastic container I start eyeballing it and my wife gives me "the look." Once I finish these tiles, I'm going to do a downtown/financial district block with tall office buildings and skywalks, always loved the looks of those. I'll be putting a couple helipads on top, too, for air assault actions! These are meant to be urban tiles, so I won't be doing any farmland or anything of that sort... Any other thoughts, guys? I'm thinking of another industrial block (a factory), several more residential blocks (one with a hospital, to be sure), a military base block, and maybe a government/palace type block. We'll see. I was tinkering with the idea of a pneumatic transportation system. Recently I picked up a giant tube of candy from one of those mall kiosks (...you know, you fill it yourself with the flavored sugar and bounce off the walls for an hour). I looked at it after I was done and said, "Hmm, I bet an Epic figure sitting in a little car would fit nicely in there." Then I bought another one. It is about 2 & 1/2 feet long and gives you some good material to work with. Flexible but doesn't crease. I wanted to use it on a moonscape but you could adapt it to a futuristic cityscape as well, I am sure. 6mm commuter train and elevated rail from Old Crow. My big hobby resolution for this year is to build a similar set-up. Andreas has set the standards high! Thanks for sharing, Andreas AKA Jav-98! Have a great Friday and a great weekend! 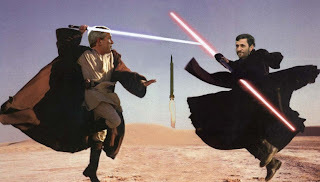 WEIRD NEWS: Star Wars EVERYWHERE!
. Whose your Sith daddy now, punk? Love the SCUD in the background... Classic! Like alot of folks out there, I'm a big Star Wars fan and it never ceases to amaze me just how much of a pop icon Star Wars has become and the lengths to which Star Wars fans will take their fan-dom. 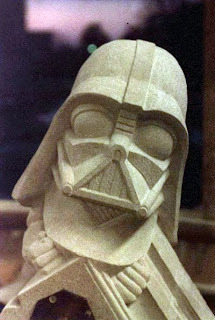 I recently read an article about a church / cathedral in the United States which erected a Darth Vader gargoyle on its roof. Who knew that R2 had a cousin in the Postal Service? I'm just a happy-go-lucky guy who isn't always so happy or lucky, BUT I try! I can be contacted at my name (without hyphens, first & last together) at that Yahoo place. The Elfwood Project - Great Art! Gone Gaming - The Gaming Blog for Geeks! CWC - New Period, New Figures! I'd Rather Be Gaming... - Gaming Blog! Jeffro's Gaming Blog: Car Wars, Star Fleet Battles, Ogre, Battletech, and more! Damned Human Race - VSF Site Extraordinaire! HOLIDAYS: Shana Tova! Happy 5769 New Year! COOL STUFF: Talk Like a Pirate Day 2008! The Dry Bones Blog - Best Comic in Israel!